The field shall be a clearly marked rectangle between 100 - 130 yards long and 50 – 100 yards wide. The field should have corner posts and a halfway line with a 10-yard radius circle in its center. The goal areas (6 x 20 yards), penalty areas (18 x 44 yards), and the corner areas (1 yard quarter arc) should be marked. The goals should be 8 yards long and 8 feet high. The penalty mark is 12 yards away from the goal line and centered on the goal mouth, while a 10 yard arc extends from the penalty mark outside the penalty area toward the halfway line. Goal nets are required, and should be properly secured to the goalposts, crossbar, and the ground. Referees must not allow the game to begin until both goals are securely anchored to the ground. 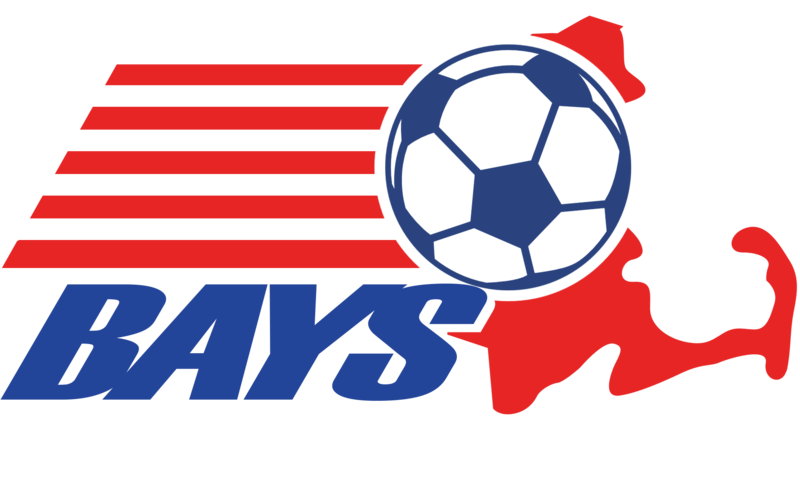 BAYS regular season and post-season games may be played indoors provided that: (a) the field dimensions conform to the recommended dimensions set forth in these by-laws; (b) the playing surface is synthetic turf; and (c) the playing surface is not enclosed by boards or other physical obstructions. For regular season games, the home team shall be responsible for any rental costs. The referee shall have the authority to designate where each team’s coaches and substitutes shall be located and where spectators shall be located. A maximum of three team officials, each with their valid BAYS passcard in their possession may be on the team sideline at any game.